From equipping young women and men with agronomy skills to helping them set up businesses along agricultural value chains, development programs are focusing bringing youth back to farming in Kenya. Starting in 2017, ICRISAT-Kenya, along with Feed the Future Kenya Accelerated Value Chain Development (AVCD) program has been helping Kenyan youth groups set up new and rewarding ventures in agriculture. “Young people are easy to train because most of them have gone to school. They are also open to taking up new ideas easily,” says Dr Paul Kimurto, from Egerton University that implemented the project in Elgeyo Marakwet. In 2017, ten young farmers from Siaya County came together to form a youth group called Ayora Young Farmers Group. After graduating with a diploma in agriculture and unable to secure formal employment, Mr Gabriel Odhiambo, Secretary of the youth group, decided to pursue farming. Most of the group members are also graduates of different agricultural courses while others are still studying agriculture. The group was set up with a focus on crop and livestock production. “Our involvement with the project started after a field day organized in Ulamba village, and we interacted with officers from ICRISAT who introduced us to finger millet and sorghum. Most of us were already farmers. 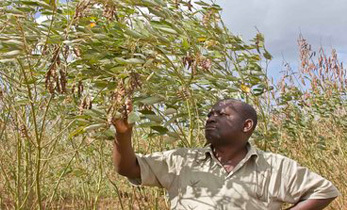 Therefore, when the idea of seed production was presented to us, we did not hesitate,” says Mr Odhiambo. 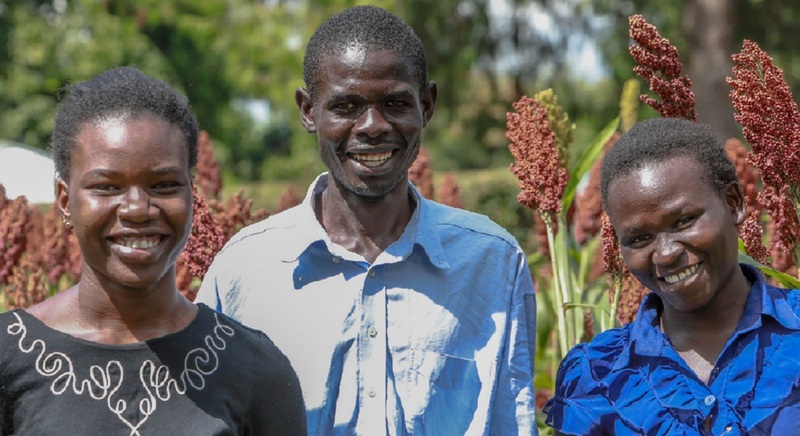 “We were introduced to two new varieties of sorghum during a Participatory Varietal Selection (PVS) at the field day. We opted for IESV24029 SH which has a large head, is high-yielding and is not easily damaged by birds. It also cannot be blown down by wind. 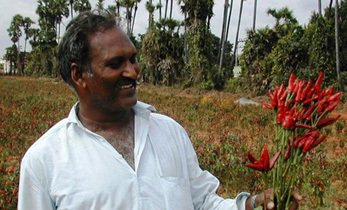 The variety also stood out to us as we can plant it twice a year,” he says. The group members were lucky to be given four acres of land by their parents. 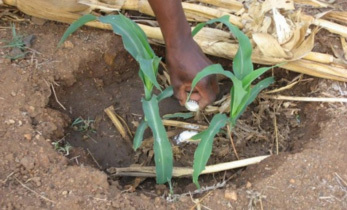 They have planted the selected variety of sorghum on the entire piece of land. “We had initially been approached by Kenya Breweries, but the variety we planted was not what they needed. This has motivated us to include that variety in our next season,” Mr Odhiambo adds. Top Link Youth Group is another group that has benefited from the AVCD Program. The group provides threshing, spraying and extension services to farmers in West Gem in Siaya County. The group was conceptualized in 2017 after realizing that the ratio of extension officers to farmers in the region was very low. 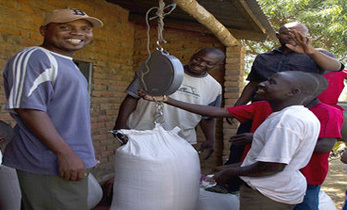 Top Link Youth Group also provides farmers with threshing and shelling services during harvest time. 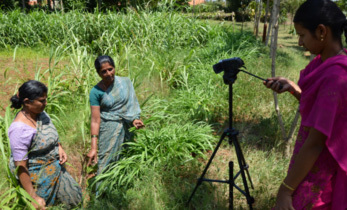 “The use of manual methods of threshing not only lead to loss of yield, but is also time-consuming, labor-intensive and costly,” Ms Immaculate tells us. “After our interaction with the AVCD project staff from ICRISAT and the Ministry of Agriculture, we realized that there was opportunity in offering shelling and threshing services to farmers in our community. The project offered us a sheller and thresher for trial where farmers would only pay a small fee for the cost of the operator and fuel for the machine,” she adds. The group now hires the threshers at KES 500 a day from the Agricultural Training and Development Centre, after which they charge between KES 150-200 to thresh a bag of sorghum. The money made by the group from shelling caters for transport, operators’ fee, and fuel. The rest of the money is set aside for the group members to share. 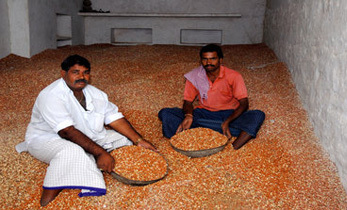 The group also makes extra income by offering extension services to farmers at a fee. For the spraying services, the group charges KES 1,500-2,000 per acre depending on the pesticide being used. These two youth groups are a clear indicator that there are several opportunities for young people in agriculture. Government and development partners should therefore seek to tap into the potential of the youth to contribute to agricultural transformation.